Hi Jade, thank you for chatting with us at Why Hello Beauty! What is Kaf.Tanned and where did the idea come from? It all came about with the customer in mind. Solving the dilemma of what to wear after a spray tan all began when I was in high school and was introduced to fake tan. I have naturally very, very fair skin so the day I found out I could dye my skin a beautiful bronzed colour I was over the moon! I started to build up a clientele of about 20-30 tans each week (I created my first ever job!). My clients were turning up for a tan in jeans, leggings, tight clothes, daggy clothes and always asking me “What do I wear after my spray tan Jade?”. It was then when I came up with the idea to design a fashionable, specially made garment to wear to ensure a flawless tan could develop. I made up a few prototypes and gave them to some of my customers to trial and they loved them! The next few years I started to put everything together e.g. website, designs etc. The name really stood out for us ‘Kaftans when being tanned’ = Kaf.Tanned put together. We launched 3 years ago with only 3 block coloured kaftans and have since launched over 40 different styles and patterns! I like to think we brought fashion in to the beauty industry! What materials and styles are available? We have a few different materials and styles available. We have lovely long and short rayon kaftans, and a super cute ruffled rayon rope dress. Rayon robes, dry fit robes and more! You will have to jump on to check out our collection at www.kaftanned.com.au. Where can we find Kaf.Tanned in Australia? We are in about 300 beauty salons Australia wide and growing! Is this product available worldwide? Any advice for a flawless fake tan? Lots! But I’ll make it short & sweet. DAY/NIGHT BEFORE – Hair removal + exfoliate, exfoliate, exfoliate! Afterwards, apply a nourishing body moisturiser the night before tan to hydrate the skin. DAY OF TAN – Have a quick shower before your tan so your skin is entirely clean, this will allow your tan to adhere to your skin evenly. Do not wear deodorant, make-up, perfume or apply moisturiser to your skin! You should now be ready to put your Kaf.Tanned Tanning apparel on and head to your spraytan sesh. Avoid any activity around water (no washing up tonight for you!) and anything that will cause sweating as this could result in uneven tan lines/blotchiness. TAN MAINTENANCE – When you are ready to shower your tan off, wash with a mild soap lightly, and always pat dry! Most importantly keep your skin hydrated, this will prolong your tan and keep it nice and even. Because I look to peek in other’s beauty cupboards, I also asked Jade a few extra q’s! What’s your HG beauty product? Translucent powder! BB cream or foundation? I know this might sound a little strange.. But throughout my makeup career I learnt and purchased an airbrush machine, now I just use a water-based airbrush foundation. I love it!! Super quick application and a flawless finish. Coffee or tea? Coffee during the day & tea at night! Heels or flats? I’m a sneakers kinda gal atm or slip ons. What do you wear to and from tanning appointments, what are your thoughts on Kaf.Tanned? I’d love to know in the comments, so let’s chat! 2017 is off to a bright start! We are in the latest edition of Beauty Biz Magazine - we hope you enjoy reading about the Kaf.Tanned brand! TBT Kaf.Tanned On Studio 10! Kaf.Tanned Summer Collection 16/17 is here bringing you lifestyle year-round styles. Whether you live the beach or dream of the bohemic escape, explore the collection of our latest and most effortlessly ethereal styles. Love. Winter has arrived and we have never been more prepared! Ranging from long kaftans to kimonos to the cutest jumpsuit you will lay eyes on! It is clear to say that Kaf.Tanned has all of your winter needs! Scroll below to see some of the snaps from our latest Winter Collection photoshoot! Check out the new winter releases here! For more on Stacey go here! Love & Lace Robe Goes To The Beach! The beautiful Love & Lace Robe is more than an 'in home' robe. 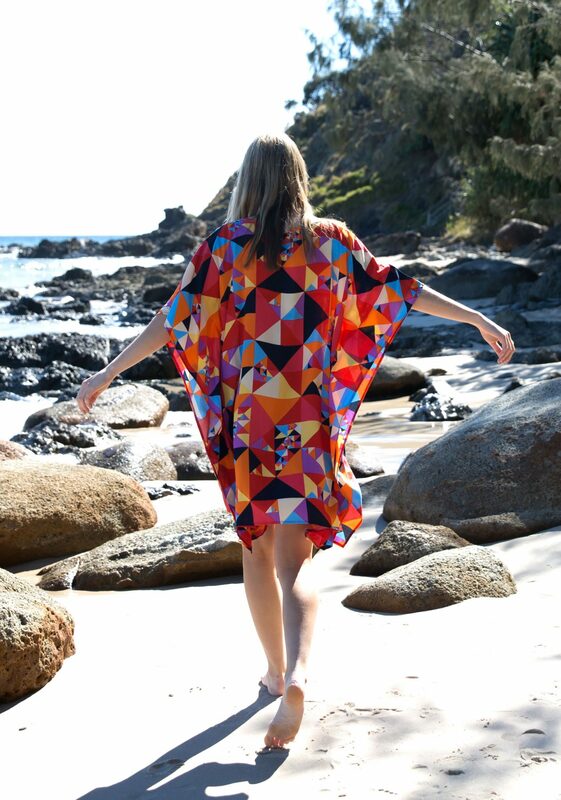 See below the stylish photos of this elegant robe in another perfect setting - out at the beach feeling very vintage and relaxed! Shop Love & Lace here! Could A Wedding Be More Beautiful?! It's the 'behind the scenes' of special days that make our hearts melt. Full of warmth, floral and love - these photos are beyond memorable. Take a look below at some of the stunning shots captured in the Roses & Poses Kaftan and let yourself be inspired! Go to the Roses & Poses Kaftan here! There is nothing like a garment that has a cool flow when you walk - making it the ultimate effortless dress. Add on a beautiful paisley print and you're set for all occasions! Take a look below to see our latest obsession - the New Romantic Kaftan and the Delilah Kaftan. Shop the new releases Here!